And now for something completely different on the charter scene as Erik Hasselman at U-Boat Worx in The Netherlands sends news that you can charter a submarine for your yacht. On offer are the C-Quester 3, suitable for a pilot and two passengers with a maximum operating depth of 100 metres and the C-Explorer 2, with one pilot and one passenger and again an operating depth of 100 metres. 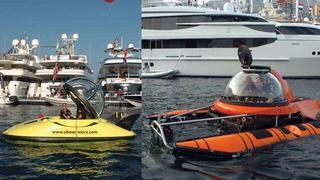 The submersibles are available to ship anywhere in the world along with a pilot and a surface officer and the minimum charter period is one month.